La Passerelle – Latest Issue! The latest issue of La Passerelle is available for downloading. 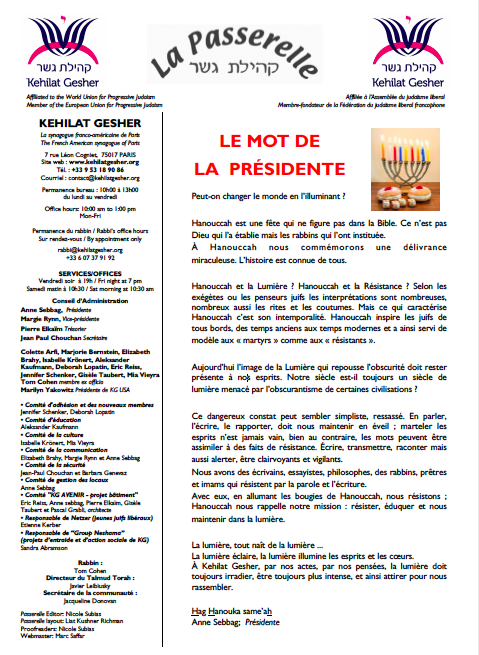 In this issue: A reflection on the meaning of Hannukka by our president, Anne Sebbag; a look at what it means be a good person by our Rabbi Tom Cohen; an exploration of Francophone Jewish poetry by Francis Leder; book reviews by editor Katia Joffo; and progressive responses to today”s Halakha questions. Note: La Passerelle is in French.